I’ve invested my money in mentors. I’ve been building my own online brand. When it comes to online marketing, I take it very seriously. I’m Chrisville owner of Chrisville Beats, I have important tips that will help music artists. 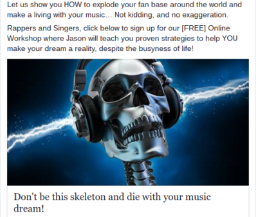 These online strategies will sell music fast! Why should you listen to me? I’ve invested my money in mentors. I’ve been building my own online brand. When it comes to online marketing, I take it very seriously. Not to mention, I’ve seen the power of what you can do when you start to position yourself better. I’ve also wasted countless hours trying to build my own online fan-base. If you listen and take action. I know you will gain from what I’m about to tell you. Let’s get started, shall we? If I had to start all over again, what would I have done differently? Better yet, what steps would I have taken to start earning money from my music? My answer would be, start to think like an online marketer. Let’s be honest, everybody is online these days. Are you going to tell me that is hard to build a brand these days? Absolutely not. Here’s the problem, most artist spend their energy on the music, not the marketing. BUT Chrisville I love being an artist. ME TOO. However, I’ve learned you must be better at positioning yourself if you want to own 100% of yourself. Meaning, cut out the middleman. Does that sound like you? If so, pay attention. I’m going to dive deep into what it really takes. Step one: Finding your target audience. Start by researching what keywords your audience is searching. Did you know you can Target those keywords using Facebook ads, Google AdWords, as well Instagram? Just imagine you knew exactly which keywords received the most clicks. You would be ahead of most music artists. Once you understand exactly where your audience is all you have to do is simply target them. Just imagine, you knew which blogs were hot, you knew were your fans hung out online. Knowing your keywords is everything if you want to be successful online. Most music artists have no idea who their target audience is. So stop right now, and go figure out which keywords to target. The next thing you should do is click the link above. This is why most of you showed up here today. Did you know email marketing is still the most advanced tool to this day? Just look at some numbers from one of our campaigns. We had over 747 opens, which 127 clicked through. Are you telling me you can’t make money with those numbers? Click this now. https://www.chrisvillebeats.com/ Email marketing has changed the way we do business in a major way. You can simply write pre-made emails, you can see exactly how your audience responds. Having data is the most powerful thing when running your own music company. Learn how to use this tool correctly and watch how your fan base will explode. This step goes back to step two. However, it makes sense to do this step now. Building your own autoresponder will allow you to work on music longer. It will also allow you more free time once you set it up. Just imagine, that you have pre-made emails already set up. Just imagine every single person who joins your email list that goes through this system. Yes, you can build relationships much faster and effective this way. This tool right here will save you a lot of time. It will also make you a lot of money if you use this properly. Not to mention sell music like you have always desired! Here’s one of our many ads we have setup. Now that you have found your targeted audience and understand email marketing, as well build your own opt-in form, it is now time to start building your first ad. Running ads that are laser targeted will increase your chances of making money as well building that massive fan base you have always wanted much easier. Since you have done the homework researching these keywords this step will be very easy. There it is. You now have 5 steps that will help you build your massive fan base. I know this seems like a lot of work. However, do you really want to cut out the middleman? Do you really want to take 100% responsibility for your music? Only you will know this. If you need one on one mentorship, I’m running a special. I have a six-week program that will help you build your massive fan base much faster. We would spend one hour each week on a google hangout or skype call for the next six weeks. By the end of this mentorship, you will know exactly what needs to be done in order to live off your music full time. If you need exclusive beats for sale, we have high-quality beats that will make you stand out from the crowd. Remember, you can sell music once you learn how to position yourself better!